I didn't know I would have to read poems to get through Don Quixote! I'm not averse to poetry; in fact, I love many, appreciate even more and adore a special few. But I've always struggled when authors insert poems, odes and songs into their work. The songs throughout The Lord of the Rings bore me to tears and I cannot tell a lie, when I finished the Prologue in Don Quixote and turned the page to start the story proper and saw seven pages of sonnets, I nearly threw the book across the room! Firstly, I've always wanted to read Cervantes 'best work of fiction in the world'*. I knew it would be challenging, so I had to wait until the right time to read it. 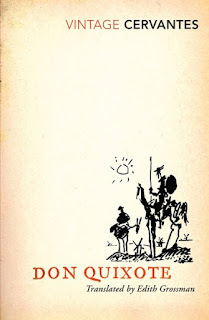 That time is now, thanks to Nick @One Catholic Life who is hosting a chapter-a-day readalong of Don Quixote starting on the 1st January 2019. As an avid reader, why wouldn't I want to know more about the story that started it all! She also enthuses about the writing, 'it gives off sparks and flows like honey. '* Wow, right? say anything you desire about this history without fear that you will be reviled for the bad things or rewarded for the good that you might say about it. Cervantes wants us to discuss his work, for good or bad. unadorned by a prologue or the endless catalogue of sonnets, epigrams, and laudatory poems that are usually placed at the beginning of books. Finally, and most importantly, thanks to Nick & co's support, I will not give up at the first hurdle. I will convert this hiccup into a learning experience instead. Nick has put up his first encouraging #Quixotereadalong post to help those of us wondering why on earth we agreed to do this! * quotes from the Translator's Notes to the Reader in my 2005 Vintage edition of Don Quixote by Edith Grossman. So far I have learnt that all these early poems are written by fictional characters to honour Cervantes own fictional character. Urganda the Unrecognised, Amadis of Gaul, Don Bellanis of Greece, Lady Oriana, Gandalin, Squire to Amadis of Gaul, Donoso, an Eclectic Poet, Orlando Furioso, The Knight of Phoebus, Solisdan and Babieca are all literary characters from some of Cervantes favourite chivalric stories. Charlemagne killing Moorish Prince Feurre. From Speigel Historiael by Jacob Van Maerlant, copied in West Flanders in 1325 to 1335. Amadis the Gaul was first published in Spain in 1508 (author unknown). It is considered to be a 'masterpiece of medieval fantasy. It inspired a century of best-selling sequels in seven languages and changed the way we think about knights, chivalry, damsels in distress, and courtly life in castles.' Amadis the Gaul also has it's very own blog devoted to it here. Don Belianis of Greece is another chivalric romance novel from Spain, often published in English as The Honour of Chivalry (author unknown). a personage in Amadis of Gaul somewhat akin to Morgan la Fay and Vivien in the Arthur legend, though the part she plays is more like that of Merlin. She derived her title from the faculty which, like Merlin, she possessed of changing her form and appearance at will. The verses are assigned to her probably because she was the adviser of Amadis. should he preserved—not for their poetical merits, which are of the slenderest sort, but because, being burlesques on the pompous, extravagant, laudatory verses usually prefixed to books in the time of Cervantes, they are in harmony with the aim and purpose of the work, and also a fulfilment of the promise held out in the Preface. Do you know what 'versos de cabo rato' are? I do! The first poem from Urganda is written in this form, where the final syllable is missing from the end of the each line. I believe the point is humour! There are various online forums (especially in Spanish) devoted to creating the endings for this poem if you dare. Cervantes doesn't believe that poetry should be limited to the humans in his story either. The faithful horses also get a chance to honour each other. Babieca was the steed of real-life, folk-hero El Cid and from him we learn that Don Quixote and his steed, Rocinante will probably spend most of the story being hungry. So now that we've got that hurdle out of the way, it's time to jump into this picaresque, road-trip novel proper. Let the journey begin. A great beginning! I'm glad the prefatory poems haven't thrown you off! Thanks Nick, I figure that Cervantes wouldn't mind me having fun with his fun! Oh, what a lovely post, Brona! I've learnt a thing or two. I figured that the poems were a parody, and found them quite amusing in themselves, especially after reading chapter one which introduces our hero. I am so thrilled with this character; he is ordinary, universal, and yet fascinating. Thank you Risa...and now that I'm up to chapter 3, I think we can safely add 'fool' to list of attributes. He is very like a Shakespearean jester with his bumbling ways and misconceptions and perceptions. Are we laughing with him or at him, I wonder? Good luck with your reading adventure. I've listened to DQ as an audiobook in the past few years. If I see it at the library I'll listen again to better follow your commentary. Isn't it fascinating just how self-referential and 'post-modern' the early novelists were. Nothing new under the sun! An audio would be a fun way to get a feel for this rather absurd character - I may have to check that out for some of the car trips coming my way this year. #Quixotereadalong continues until 8th May. I've checked out some of the novels and authors influenced/inspired by DQ and may need to reread City of Glass by Paul Auster as Dan Quinn is modelled on Quixote and finally tackle The Moor's Last Sigh (Rushdie) and maybe even have another go at Madame Bovary (which I gave up on after a few tedious chapters). I've also been haunted by Coetzee's The Childhood of Jesus since reading it 5 or 6 years ago - it confounded & fascinated me in equal measure at the time and I always knew I would have to reread it at some point (after finally reading DQ that is). I read DQ in high school as an English mini-course. The teacher told us this was her favorite novel, and that passion for DQ is what I remember most. The teacher also taught Spanish, and she had read the book in both English and Spanish many times. I have somehow let days 2 and 3 slip by me, but I intend to get right back into the saddle today. That's why I enjoy these readalongs so much Deb - reading a book that I know next to nothing about, with people who have a history and passion for it - it's encouraging and motivating. This is so funny, because I feel exactly the same way. The poetry of DQ and LOTR were SO boring to me that I skipped them altogether on the first reading. I enjoyed them while listening to the audiobooks, however, so apparently poetry and I only agree when I hear it.